As previously posted, I located an image of the residence of my great-grandparents José María and María de Jesús Alvarado from the late teens and 1920s at 543 S. Fremont Avenue in the USC Digital Archive, after researching a 1920s Baist map. Recently the USC Digital Archive has begun offering high-resolution downloads of its vast resources. So I was able to purchase a high-resolution image of that photograph to get a better view of the Alvarado residence on Fremont Avenue, which is today where the Harbor Freeway goes through downtown Los Angeles. And here’s a detail of that image. 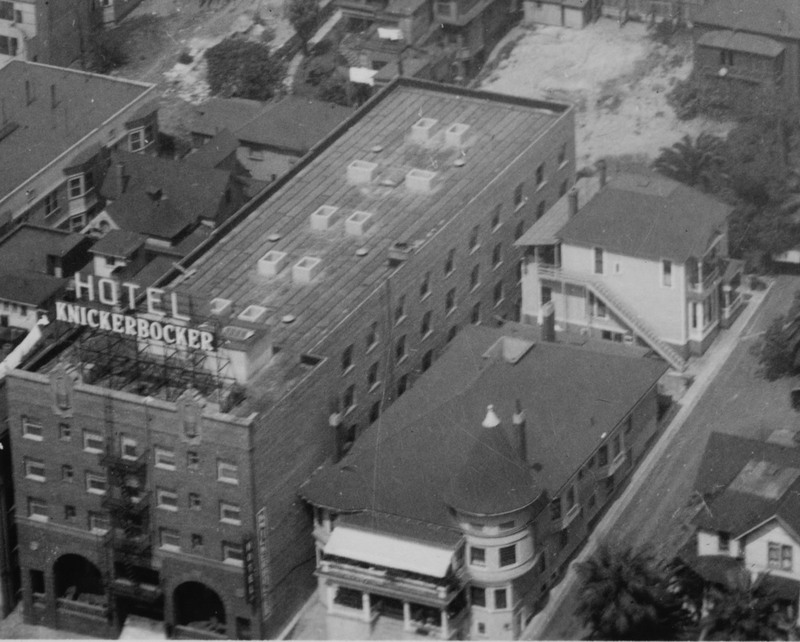 The residence is the white two-story structure to the upper right of the Knickerbocker Hotel, back from the street. The USC Digital Archive also had a very interesting panorama shot that shows the entire block of Fremont Avenue where the Alvarados lived. It’s along the bottom right of this photo. The Knickerbocker Hotel is at the bottom center of the image, with the white Alvarado residence to its upper right.